All year the cost of gas has been rising in the United States of America. Due to political revolutions going on in various countries in both North Africa and the Middle East, which are all oil rich nations, the cost of gasoline and goods made using oil have been growing in the past four months. To make matters worst, every time it seems that gas prices cannot get any higher than they already are, they jump up rapidly. In many parts of the nation, the average price for just one gallon of gasoline is well over four dollars. One of those places is the San Francisco Bay Area where in some parts of the region, even regular gasoline is hovering well past the $4.20 marker. As of Monday, the average price of one gallon of gas was sitting at $3.952. Over the course of the last forty-four days, the average price of gas in the United States has increased every single day without fail. This past weekend saw a 3.4 cent increase on average throughout the country. 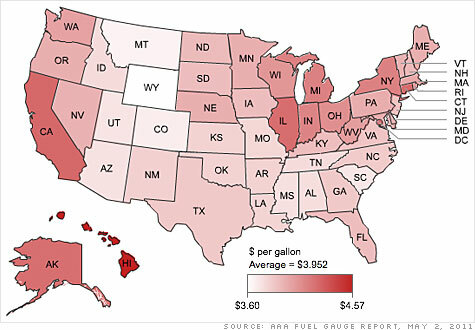 The state with the highest average price per gallon was Hawaii. Conversely, Wyoming has a very low average price per gallon of gas statewide at only $3.60. Gas prices in parts of the country have increased as a result of the storms and tornados in the south that forced oil refineries to halt business for days. Experts predict that the national average will surge past four dollars by the end of the week. Many are expecting the milestone to come by the end of Wednesday. The last time the average price for one gallon of gas in America was at or above four dollars was in July of 2008. In the last four months alone, the national average has increased by nearly a dollar at eighty-eight cents. Many experts believe that prices are not going to get too much higher than they currently are. By the end of the month, many assume that prices are going to begin to shrink back down to reasonable rates for Americans. With there being no end in sight for the tensions in the Middle East and the uncertainty about what is going to happen in the Middle East now that Osama bin Laden is dead, it is tough to say exactly where the prices for oil and gasoline will move in the upcoming weeks and months.